By far one of the most rewarding things I have ever done to date as a parent took place yesterday when I took my boys out to the Sydney Children's Hospital yesterday to meet the beautiful and insanely inspiring kids and the gorgeous volunteers. 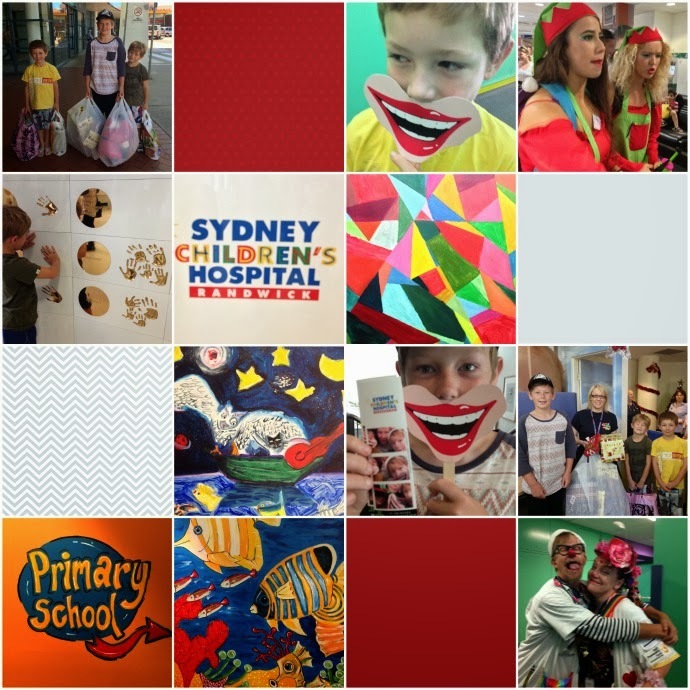 These volunteers are part of the Children's Hospital Foundation and work tirelessly to not only raise much needed money for the Children's Hospital, but to make the kids stay in hospital as fun as a hospital stay could ever be. I've talked before about how I am emotionally attached to the hospital as it is where probably about 20 or more of my operations took place when I was a wee squid myself. So it was important to me that my boys saw this amazing place for themselves and understand about that part of my life. They listened as I told them stories whilst we walked along the hospital corridors and they asked a million questions as they were shown around the hospital school and we talked about what it is like to spend night after night away from your family when you are a small child in hospital. 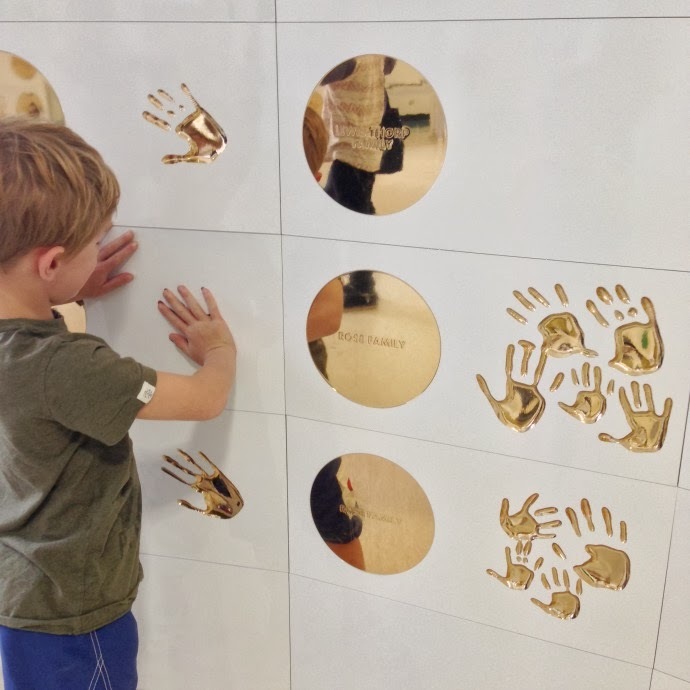 They placed their hands in memorial plaques for little lives and were shocked when they realised that their hands were bigger than many of those hand prints. No words were needed for the older two to understand what that meant. Most importantly I wanted them to meet the courageous kids who are there. To see their infectious smiles and feel their courage and through all of that, I hoped they would gain an appreciation for how lucky they are themselves. I wanted them to learn through experience how good it feels, insanely good to the core, to give to others and to do something for someone else without expecting anything in return. I am sure it mostly went over the head of my 6 year old, as I expected at his age, but there was one particular moment when I knew that Sam my 8 year old got it. He was given a green truck model by one of the volunteers we met and his eyes completely lit up when they handed it to him. He carried it with him as we toured the hospital, itching to take it out of the packaging. It was when he was sitting down watching a reptile show and a little boy no more than 3 walked in with his Mum and sat down next to Sam. This beautiful little boy was completely bald and hooked up to numerous tubes and my parental heart just ached at the sight of him. I watched on as Sam stared and stared and at the point I was about to nudge him to quit staring, he leaned over to the little boy and gave him the green truck and a big smile. He soooooo got it, he understood why we were there. 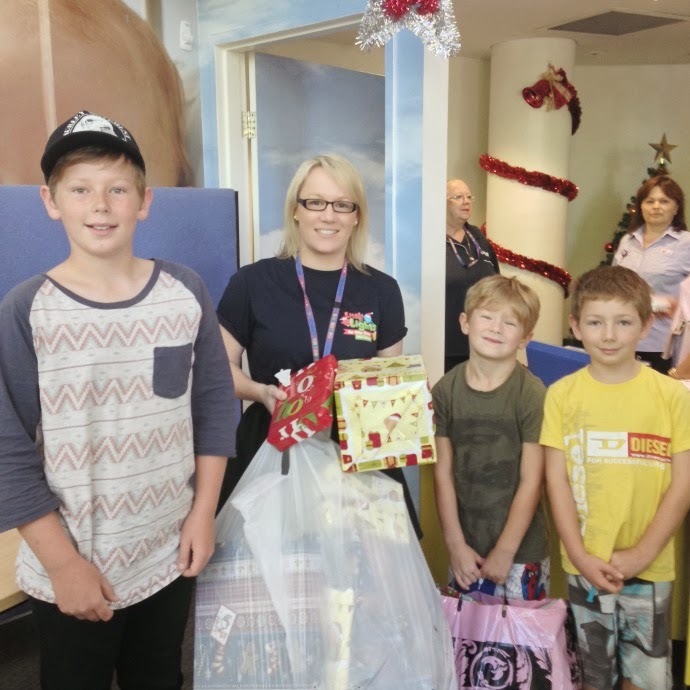 Yesterday the boys carried into their hospital HUGE bags of gifts that were so generously donated by the families at their school and our gorgeous neighbours, but they left with an even bigger gift - they left that hospital with hearts that were full to the brim with empathy and understanding and genuinely inspired to do more good. Many of you have asked what you can do to help or be a part of this, so here is where I reach out to you on behalf of my boys and ask you to buy a Christmas light for yourself or a loved one and by doing so - show your support and help the fabulous Little Lights for Little Lives Foundation make a difference to sick and injured children this Christmas. You can purchase a light here. If you would like to learn more about the Children's Hospital Foundation, the courageous stories of some of their patients, or find out how you can help or get involved - go here. On behalf of all those gorgeous kids we met in the hospital yesterday - Thank you.